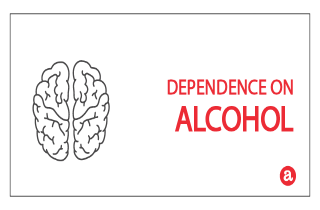 Alcohol dependence manifests when the central nervous system adapts to the presence of alcohol in the body. People who are dependent on alcohol experience withdrawal symptoms when drinking slows down or stops. More on alcohol dependence here. Often, people drink to try and reduce symptoms of underlying emotional or psychological disorders (also known as self-medicating). But in the long term, alcohol makes these disorders worse because it interferes with the chemical balance in our brains. What happens to cause alcohol dependence and how can it be treated? We review here. Then, we invite your questions about physical dependence on alcohol at the end. Alcohol dependence and alcohol abuse are two types of problem drinking. But these two conditions manifest specific symptoms and require different types of treatment. So what are the differences between abusing alcohol and being dependent on alcohol? Alcohol abuse occurs when a person drinks too much and too often but is not physically dependent on alcohol. In addition to its physical effects, this abuse can lead to dangerous behavior such as driving a car after drinking, or to legal problems such as an arrest for drunk driving. Alcohol abuse can also involve trouble with personal relationships and with taking care of home or work responsibilities. People who abuse alcohol often continue to drink, even though they know it may cause these problems. Alcohol dependence is diagnosed when, upon slowing down or stopping drinking, a person experiences withdrawal symptoms. When they stop drinking, an alcohol dependent person can get nauseated, sweaty, shaky, and restless. These withdrawal symptoms cause them to start drinking again, even though doing so can lead to physical or mental problems. This is why alcohol dependence is considered a more serious problem than alcohol abuse. It is an indication of the presence of alcoholism, a lifelong disease in which people have a strong need to drink, cannot control their drinking once they start, and need to drink greater amounts of alcohol over time. Alcohol dependence time: How long to be dependent on alcohol? When you’re drinking on most days, you can become psychologically dependent on alcohol. Breaking your drinking cycle is an important way to test for and tackle dependence on alcohol. Try taking some days off from drinking. It can prevent your body from becoming accustomed to alcohol and help to lower or reset your tolerance. If you drink regularly, your body builds up a tolerance to alcohol. Tolerance is a physiological response we have to any drug: the more you consume, the more your body needs to have the same effect. Regular drinking induces certain enzymes in your liver that break up (metabolize) alcohol. If you drink heavily over weeks or months, levels of these enzymes go up, your tolerance builds and you need more alcohol to get the same effects. Brain systems get tolerant to alcohol too, and although you may be able to walk a straight line after drinking quite a lot, this means the brain has adapted so that next day the brain cells expect alcohol. Keep in mind that it is never advised that you go cold turkey off alcohol if you’ve become dependent on it. Other symptoms which occur during alcohol withdrawal can include: clammy skin; enlarged (dilated) pupils; headache; insomnia (sleeping difficulty); loss of appetite; nausea and vomiting; pallor; and rapid heart rate. A severe form of alcohol withdrawal called delirium tremens can cause more severe symptoms that require medical treatment including seeing or feeling things that aren’t there (hallucinations) and/or seizures. Physical dependence on alcohol occurs when a person’s body has adapted to chronic drinking, and manifests as physical symptoms when s/he stopped drinking. NOTE: A person can be psychologically dependent on alcohol without being physically dependent, but a person can’t be physically dependent without being psychologically dependent. Chronic alcoholism occurs when physical and psychological symptoms of dependence are present. Alcoholism is treatable and controllable, but not curable. Psychological dependence on alcohol include drinking in order to function “normally” and feel good. If you use alcohol to try and improve your mood, you may be starting a vicious cycle. Anxiety, depression and suicidal feelings can all develop when you’re psychologically dependent on alcohol. This is because regular, heavy drinking interferes with neurotransmitters in our brains that are needed for good mental health. Being dependent on alcohol can also affect your relationships with your partner, family and friends. It might mean you don’t perform well at work and if that continues for any length of time you could face losing your job, leading to financial problems as well. If you think your mental health is suffering because of your drinking, but you feel you’re not able to stop, ask for professional help. Non-judgmental assistance is available all over the country. If you suspect that you are dependent on alcohol, never try to quit drinking cold turkey. Always seek medical assistance. Permanent and life-long abstinence from alcohol is the best treatment for those who have gone through withdrawal. It is important that after alcohol dependence withdrawal a person goes home to a living situation that helps support them in staying sober. Some areas have housing options that provide a supportive environment for those trying to stay sober. Still have questions about alcohol dependence? Please leave your questions in the comments section below. We do our best to respond to you personally and promptly. Go Ask Alice: Is drinking addiction psychological or physical? My niece is planning to stop drinking cold turkey because she was diagnosed with Gastritis. She’s been drinking Cabernet red wine one bottle a night for 2 yrs with a few exceptions and drinking a little less some nights and a extra glass besides the bottle @ times. She says she never drinks during the day and does not wake up trembling or other symptoms if she drinks less. I’m just wondering if this is safe for her to do cold turkey. She says she drank 2-3 glasses 2-3 times a day prior to the previous 2 yrs for 3 yrs. prior to that she hardly ever drank. Maybe a glass of wine at social events which was not often. I am wondering if it’s safe for her to stop drinking abruptly. But she says she was just diagnosed with the gastritis and has abdominal pain but not constant. She told the Dr she drinks some but didn’t tell how much she drank. It was recommended she stop drinking because of the gastritis. Advice please. Hi, Anita. Alcohol withdrawal can be hard to overcome by itself. I suggest that your niece considers rehab stay and/or therapy sessions. My family is going through a difficult time now, and with professional counseling, we are learning a lot of things we never really put together when I was growing up. I have one sibling and we are both in our 40s now, and our parents are in their 70s. Growing up, my father wasn’t around much. My parents were married, happily I thought, but it just wasn’t my father’s lifestyle to be home or around us much during the week. My father owned a business and my mother worked for him. I do remember spending a lot of time in the company’s building, so my mother could balance work and childcare. She was responsible for everything, taking care of us, doing all the work around the house (we helped as we grew and were capable of more), cooked all meals, did all the shopping, took us to doctor appointments, drove us to all our events, did daily school pickups and dropoffs until we got old enough to walk home alone, and then eventually we drove ourselves. I don’t remember my father ever cooking a meal, giving us a bath, or driving us to school, except when it was on his motorcycle or in a unique promotional vehicle he used for his business. My father was asleep when we left for school in the morning, and we didn’t see him again until the following morning. His routine was to have an employee telephone him, and the phone would ring endlessly until he heard it and woke up. He said alarm clocks did not work for him. I know about the phone arrangement because I would hear it ring for 10 or even 15 minutes on the days I was home sick from school. He would go to work, and then after work, he would meet friends of his at one of several bars. Some were upscale, none of them shady. He would do this every night. Sometimes my mother would take us and we would meet my father at one of his bars and we would have dinner together there, or go somewhere else for dinner. I became familiar with his drinking friends. From what I understood, he never got drunk, and he said that he would begin with one or two drinks, and then switch to soda for the rest of the night. At 5 or 6 years old, I knew my dad’s favorite drink was peppermint schnapps. I don’t think I ever saw him drunk; I don’t remember him ever slurring his words or having a car accident. Was my dad an alcoholic? I wonder if he would have been able to continue to meet up with his friends on a nightly basis for as long as he did and not drink alcohol; did he do it for the alcohol, or the be around the same people, or was it a combination of both? I don’t think it’s responsible father and husband behavior, but I’m not sure if that’s addict behavior either. He discontinued that behavior about 20 years ago, after his business downsized dramatically, so he didn’t have office managers to take care of daily operations anymore, he was needed to be there physically much more. But I think he may have a glass of wine or hard liquor each night to help him fall asleep. I’ve heard him talk about how it helps him, but I haven’t seen evidence of empty bottles in the recycling, or smelled alcohol on his breath when I’ve gone to visit. I can’t figure out if this is psychological dependence, or just a habit. Hi Sam. Some people have a problem drinking and can be highly functioning people at work and at home. I am glad that your dad was able to downsize on the drinking when the circumstances requested it. I was wondering if one were to no longer become physically dependent on alcohol after going through withdraw from a severe addiction, can they have a drink or two socially while being monitored? Or will this cause the person to endure the exact same symptoms of withdrawal that they did when drinking everyday heavily for months? Even if absolutely no symptoms have surfaced for months? Hi Tricia. It sounds like you are describing some of the “post acute withdrawal symptoms” (PAWS) that can accompany heavy drinking. Do some reading on PAWS for alcohol withdrawal and inform your friend (and his doctors) about these symptoms…keeping a calendar record of the symptoms can help! My friend has been drinking heavily for over 30 years. He is now 76 years old. His doctor told him he needed to detox from alcohol and he agreed. He went into or under the detox drug Atavan on October 6, 2014 and was gradually tapered off it the following week. He was in a very poor mental state after being tapered off the Atavan. My friend wanted to get out of bed and get out of the hospital because he was obviously going stir crazy in the hospital room. We are now approaching one month after he entered alcohol detox. He is in his home but he has a major case of insomnia (never, ever, sleeps at night and sleeps only 20 min in the mid morning) this has been going on since they doctor tapered him off the detox drugs!! Will my friend recover? Will it just take him some time and patience? Is it really so terrible to enjoy getting drunk? I mean, I avoided it for years, always under the impression that it was a “bad” thing, and obviously alcoholism in the extreme is a terrible disease that can negatively affect people’s lives – I don’t discount that at all. However, just recently I started drinking a bit, and got quite pleasantly drunk, and I really liked the feeling…a lot. Nothing bad happened. I just had a few (OK, maybe quite a few) drinks until I felt quite “happy”; watched TV and staggered around my apartment for a bit while enjoying the feeling; and then went to bed. The next morning, sure, I felt a little lethargic and my thinking was a little fuzzy for a bit, but otherwise, all back to normal. So now I have done this on and off for several months. I don’t go out and drink; I just enjoy the experience at home. I’m very careful not to drink so much that I end up “falling-down, throwing-up drunk” but I do drink enough to get to that lovely woozy pleasant feeling. Once in a while I might do this several nights in a row (depending on whatever’s going on in the rest of my life), but more often it’s hit and miss, here and there. So, must I really be all that worried about this? I’m not drunk 24/7 and frankly, no one ever sees me drunk. I’ve just found it to be a very pleasurable activity that I do (mostly) now and then. Is that really so bad?